Back in 2008, I started reading John Smelcer's The Trap. I read only a few pages, and stopped reading, because those opening pages reminded me of my childhood, living with my grandmother. I shared those memories and immediately heard from people in Alaska, that Smelcer is not Native. At a Native Studies conference a few months later, I learned a lot more about Smelcer's claims to Native identity. As I came to know, the mere mention of his name raises the ire of Native and non-Native scholars who work in Native literatures. People have concerns about his claims to Native identity, and concerns about his writing, too. Here's one example specific to his writing. In the Spring issue of KROnline, we published two poems by John Smelcer, “Smoke Signal” and “Indian Blues.” I appreciate the many readers who have contacted us to point out that these poems contained damaging stereotypes of Native people. I deeply regret the manifest distress this has caused and take full responsibility. We will continue to welcome—and to seek actively—Native voices, and those of other underrepresented communities, to all Kenyon Review publications. Digging in a bit, I learned that those two poems are in Smelcer's Indian Giver. When I looked up that book, I saw that it--like all of Smelcer's other books--had glowing praise from very prominent people. This was something I'd noticed back in 2008. Among the people Smelcer lists as having praised or collaborated with him are John Updike, Carl Sagan, Noam Chomsky, Allen Ginsberg, Chinua Achebe, Ursula K. LeGuin, J.D. Salinger, Lucille Clifton, the Dalai Lama, and Jack Zipes. I've interviewed people before for articles but would not characterize the product as a "co-authored" item. Have you seen that done before? When I read the author’s website, I learned he listened to the stories of this time and place as told by his adopted grandmother and her sister. Here are screen shots of the last two pages of the 23 page document, followed by direct quotes from the screen shots, and my response to them. Smelcer wrote: "You’d think the attacks would end now, but a woman named Debbie Reese continues to criticize me on the Internet, saying that I have no business writing books about Alaska Natives or Native Americans, not even about my own grandmother, who implored me for years to write my novel, The Great Death, about a pandemic that devastated Native communities all across Alaska nearly a century ago, including my own tribe." My response to: I have never said that John Smelcer has no business writing books about Alaska Natives or Native Americans, or his grandmother. With this blog post, I ask Smelcer to provide evidence for that statement. 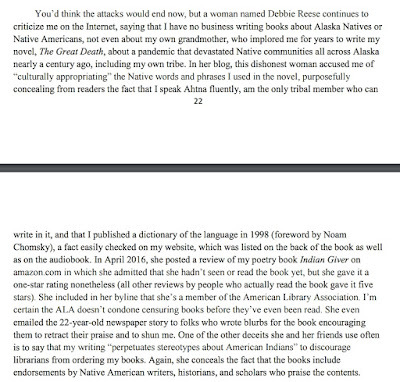 Smelcer wrote: "In her blog, this dishonest woman accused me of “culturally appropriating” the Native words and phrases I used in the novel [The Great Death], purposefully concealing from readers the fact that I speak Ahtna fluently, am the only tribal member who can write in it, and that I published a dictionary of the language in 1998 (foreword by Noam Chomsky), a fact easily checked on my website, which was listed on the back of the book as well as on the audiobook." My response: I have not reviewed The Great Death at my blog or elsewhere. I did not say Smelcer was "culturally appropriating" the Native words and phrases he used in the novel. I did not purposefully conceal from readers that Smelcer speaks Ahtna fluently, or that he is the only tribal member who can write it, or that he published a dictionary of the language. With this blog post, I ask Smelcer to provide evidence for that statement. Smelcer wrote: "In April 2016, she posted a review of my poetry book Indian Giver on amazon.com in which she admitted that she hadn’t seen or read the book yet, but she gave it a one-star rating nonetheless (all other reviews by people who actually read the book gave it five stars). She included in her byline that she’s a member of the American Library Association. I’m certain the ALA doesn’t condone censuring books before they’ve even been read." The Great Death was short-listed for the 2011 William Allen White Award, and nominated for the National Book Award, the BookTrust Prize (England), and the American Library Association’s Award for American Indian YA Literature. Please note an error in the "About the Author" section and the "Awards" section of this page. The American Library Association does not have an award for American Indian Young Adult Literature. When I receive a copy of Smelcer's book, I will update this note with a review of the book itself. Below is a screen capture of my comment. As I believe my comment shows, Smelcer is misrepresenting my words. Smelcer wrote: She even emailed the 22-year-old newspaper story to folks who wrote blurbs for the book encouraging them to retract their praise and to shun me. One of the other deceits she and her friends use often is to say that my writing “perpetuates stereotypes about American Indians” to discourage librarians from ordering my books. 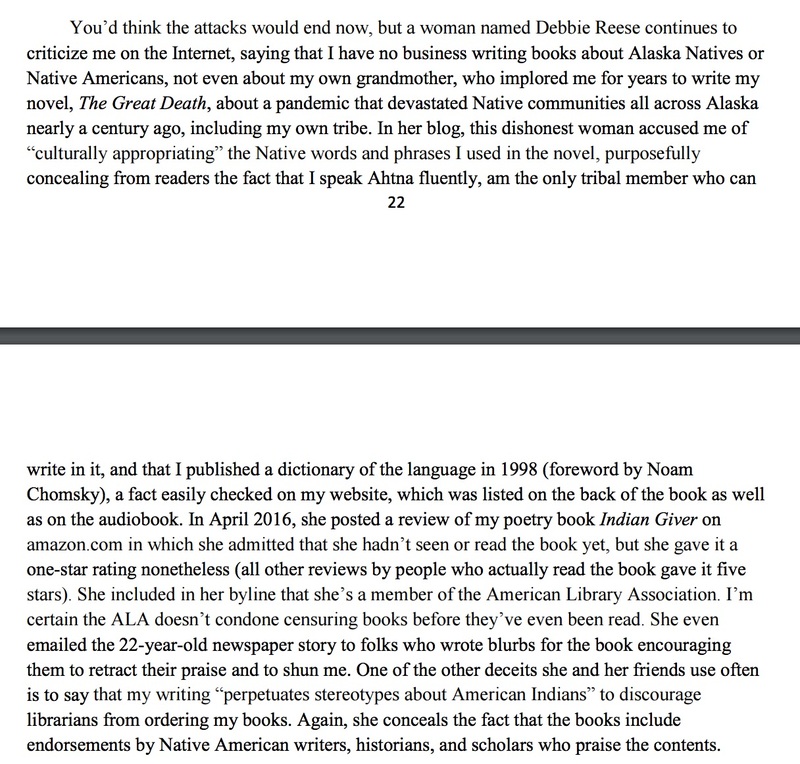 Again, she conceals the fact that the books include endorsements by Native American writers, historians, and scholars who praise the contents. My response: On the Amazon page for Indian Giver, I saw that Roxanne Dunbar-Ortiz was being quoted as having said Smelcer is "One of our most brilliant poets." I correspond with her frequently, particularly of late because Jean Mendoza and I will be adapting her Indigenous People's History of the United States for young adult readers. Given my correspondence with her, I could verify that blurb. I asked her about him and I did send the newspaper articles to her. Smelcer says I sent these articles to others who wrote blurbs. With this blog post, I ask Smelcer to provide evidence for what he is saying. I wrote to Dr. Dunbar-Ortiz to ask her about it. She told me she had been introduced to him and that he told her he is Native. Later he sent her the draft of Indian Giver. In good faith, she provided him with a blurb that is being used to market that book, but her words are also on the cover of Stealing Indians. She didn't read Stealing Indians. It strikes me as disingenuous for Smelcer to use her words for one book to praise a different one, and his doing that makes me wonder about all the blurbs on all the other books. Are they legitimate? Or is Smelcer dropping the names and words of all those people here and there to give him credibility? For most of them, we can't find out because they're deceased. Dr. Dunbar-Ortiz has written to Smelcer, asking that he not use her words to promote his work. He is ignoring her. She has also written to his publisher, to no avail. I did not encourage Dr. Dunbar-Ortiz to retract her praise or to shun him. I have not said Smelcer stereotypes American Indians. In fact, because I found the controversy over his identity so unsettling in 2009, I did not finish The Trap and did not read subsequent books. I am currently reading his latest young adult book, Stealing Indians, and will post a review when I finish writing it. My response: I have never spoken with John Smelcer, in person or on the telephone. I never said, to anyone, that I was going to destroy John Smelcer and make sure that no one would ever publish his writing again. Smelcer wrote: "Friends who have contacted her on my behalf have reported similar responses." My response: I received a letter from Larry Vienneau much like the one in Smelcer's document, but I did not respond to it. I don’t understand her obsession with me. She heartlessly obstructs my sole means of providing for my family and for my daughter’s future. How many emerging Native voices has she silenced over the years? How many deserving books have been disregarded by the industry because of her? There are over 500 tribes in America. In no way does she represent or speak for all Native Americans. She is not even a spokesperson for her own tribe. If you are in the publishing industry—a librarian or magazine or journal editor or a literary prize committee member—please stop empowering this bully. My response: I am not obsessed with Smelcer. 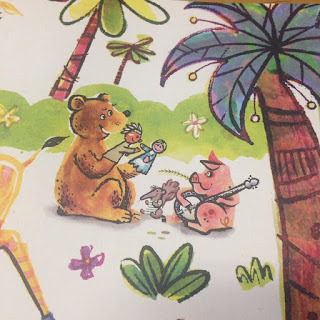 I am a scholar in children's literature. As such, I study children's books about Native peoples. People in the children's literature community know my work, and that I advocate for Native writers. As a critic, I review children's books, drawing from print resources, and from colleagues in Native Studies, too. I do not purport to speak for all Native Americans. I am not a spokesperson for my tribe and never said that I was. Again, I am a scholar in children's literature. I stand by my work, and when my review of Smelcer's Stealing Indians is ready, I will stand by it, too. Earlier today, Kimberly Gail Wieser of Wordcraft Circle of Native Writers and Storytellers, posted the following statement to Wordcraft's page at Facebook. As you will see, she did not name the writer. In asking permission to share it, I said I was going to use his name. She said that was fine. For more than 20 years, Wordcraft Circle has been supporting the work and words of Native writers and storytellers throughout the world. During that time, Wordcraft has had an open policy regarding Indigenous identity. but we have never served to substantiate nor deny anyone's claims. Yesterday, it came to our attention that a writer was using the name and alleged personal communications of our late founder Dr. Lee Francis III to substantiate claims of identity. Identity is between an individual and any sovereign nation with which he or she claims a relationship. We have also always maintained and continue to maintain a neutral stance in disagreements between writers. We are disheartened by this conflict and all other conflicts like this we have seen in the field. We are greatly disappointed by this use of our late founder's name to substantiate malicious attacks and by the general atmosphere of such disagreements in the field. Writers who engage in this sort of behavior will not find themselves welcome in our organization. His words suggest that he spoke to them. I asked Roger Sutton at Horn Book and Kiera Parrot at School Library Journal. Neither has spoken to Smelcer. I am waiting to hear from Vicky Smith. A few minutes ago, Smelcer tweeted "My new book is about love, compassion & mercy. Out of love, I forgive Debbie Reese for bullying me for 10 years:" (followed by a link to the book). Sounds more like he's using his attacks on me to now promote his new book. The twists and turns of interactions with him are unpredictable. 1) I find it distressing that John would use a personal communication with my father to justify the fight in which he has chosen to engage Debbie Reese. Many of you knew my father's personal views on Identity Politics but he would never have consented to playing the Straw Man for defensive posturing in a digital media fight. 2) Both myself and others have read the "communication" and doubt the veracity of the document. My father was very precise in his language and would not have made several of the spelling mistakes that are (were) present in the document. 3) My father would not have been a part of any fight which would have turned to name-calling and half truths, especially against a Pueblo woman. 4) Certainly my father took on many battles about identity for many folks (some a part of this group) but his role as the National Director of Wordcraft Circle should not be considered an endorsement of any member's claims on heritage or identity. 5) I know my father had many flaws and certainly some inconsistencies, but using his words to further name calling and attacks is something I find incredibly offensive as his son. I find this entire saga frustrating. In 2007, when I first received emails telling me Smelcer is not Native, I had a choice to make: (1) Delete that blog post entirely and ignore the voluminous discussions in Native circles about Smelcer's claims, or (2) continue to write about it for the sake of furthering what people know about claims to Native identity? I obviously opted for the latter. As best as I can figure out, Smelcer was born white, was adopted by Charlie Smelcer who was Ahtna (he is deceased -- today, Jan 3, 2018, I read that Charlie Smelcer is not deceased. I apologize for the error), and due to the Alaska Uniform Transfers to Minors Act, John Smelcer is able to say that he is Native (see this language in the Consent to Appointment as Custodian of an Inter Vivos Gift of Stock for a Minor Child: "I understand that the Alaska Native Claims Settlement Act (ANCSA) defines "Native" as... [...] an adoptee of a Native or of a descendant of a Native whose adoption occurred prior to his or her age of majority"). With that Act, John Smelcer was able to get a document from the Bureau of Indian Affairs that says he is 1/4 Native. Many Native people think it is misleading for him to say he is 1/4 Native because it implies he is Native by birth, when he is not. Lucy married white men, three times, her five half-breed children marrying whites as well, until she no longer saw herself or her mother in the faces of her grandchildren or great grand-children, until one day when she was very old, one of her grandsons with light hair and blue eyes--one of the only ones left who could still recite the old myths and speak her old language--would tell her stories... Including this one. That tells me that the grandson is Smelcer himself. It is written in a way that tells us he has light hair and blue eyes because his grandmother and her children married white people. It tells us that he is Native, by birth, which isn't true. The opening to the book says that "This story is a work of fiction. Every word is true." I do not know what to do with those two sentences. The first one can be used to dismiss concerns with accuracy, but what are we to make of the second one? If this entire saga was limited to questions about his identity, I might come to his defense because I believe, as I've said many times on AICL and in lectures, that the sovereignty of Native Nations means that they determine who their citizens or members are. However! There are so many other questions about Smelcer and what he says. Last night, I noticed that on his webpage about his The Gospel of Simon, due out in September of this year, he includes a blurb from Coretta Scott King, who died in 2006. His Indian Giver has a blurb from Howard Zinn, who died in 2010. Stealing Indians, due out in August, has a blurb from Chinua Achebe, who died in 2013. All these books are published by Leapfrog Press. I would love to see the letters these individuals wrote. I wonder if Leapfrog has copies of them. I'll write and ask. On his website, Smelcer lists all manner of prizes and distinctions he's received. I would love it if he'd provide links to them. He holds a PhD from Binghamton. That is a research doctorate, which means he knows how to properly cite and reference such things. I wish he would. For readers looking for action-packed survival stories in real life situations, here’s a selection of fiction and nonfiction about struggles to live through harrowing condition at sea, in the mountains, and in the wilderness. That paragraph is followed by book reviews. The first one is a review of Roland Smith’s Peak and that review ends with “other books about survival in the mountains” which is a list of four books: Into Thin Air by Jon Krakauer, Alive: The Story of the Andes Survivors by Piers Paul Read, Savage Mountain by John E. Smelcer, and Death Mountain by Sherry Shahan. There is no text on that page that calls Smelcer’s book "one of the greatest survival stories of all time." It is, I think, a "half truth" of the sort that Lee Francis referred to above in his statement. Smelcer characterizes me as a cyberbully who has bullied him for 10 years. I understand why he feels that way, but as I noted above, he has a research doctorate. He knows how to cite material. He could clear up all these half-truths that are undermining his credibility if he'd employ what he learned at Binghamton. If he does so, I'll be back to direct AICL's readers to them. Note (June 12, 2016): One thing I do when writing my critical analyses is read history and legal writings related to the book/author. Smelcer's legal claim to Native identity led me to an article that I'll be studying: Indian Country and Inherent Tribal Authority: Will They Survive ANCSA? by Professor of Law Marilyn J. Ward Ford, published in 1997 in the Alaska Law Review. Ford provides historical background for the law by which it became possible for Smelcer to own shares in an Alaska Native corporation, and to say, legally, that he is Native. Jared’s plane has crashed in the Alberta wilderness, and Kyle is first on the scene. When Jared insists on hiking up the highest hill in search of cell phone reception, Kyle hesitates; his Cree grandmother has always forbidden him to go near it. There’s no stopping Jared, though, so Kyle reluctantly follows. After a night spent on the hilltop―with no cell service―the teens discover something odd: the plane has disappeared. Nothing in the forest surrounding them seems right. In fact, things seem very wrong. And worst of all, something is hunting them. Karen Bass, the multi-award-winning author of Graffiti Knight and Uncertain Soldier, brings her signature action packed style to a chilling new subject: the Cree Wîhtiko legend. Inspired by the real story of a remote plane crash and by the legends of her Cree friends and neighbours, Karen brings eerie life―or perhaps something other than life―to the northern Alberta landscape in The Hill. In its review, Kirkus says there's also a Wesakechak, and that Bass provided an author's note about her research. I will definitely get The Hill and be back with a review.